A conversation with the novelist Nicholson Baker, whose latest book, Double Fold: Libraries and the Assault on Paper, makes the case for old news and the long shelf life of the printed page. A brief biography, collected articles, general information about Free Flight, aviation links, and contact information. hen former marine pilot Ken Michelsen gave James Fallows his first flying lesson in 1996, he could hardly have imagined that his pupil would turn out to be in any way important to the small-plane world. Fallows, after all, was a mere hobbyist, taking up flying relatively late in life, and not especially enthusiastically. After an inauspicious first few lessons, though, Fallows grew to love flying, eventually acquiring both an instrument-rated flying license and a small plane of his own. As his passion for flying broadened into an interest in the industry as a whole, he began to become aware of some potentially revolutionary innovations being pioneered by enthusiast-entrepreneurs. With the help of incentives from NASA, scores of small companies had been racing to develop cheaper, safer, more comfortable small planes intended to appeal not just to hard-core enthusiasts but to the general public. If such planes were to catch on, Fallows realized, they could introduce a desperately needed measure of flexibility and convenience to our maddeningly inefficient air-transport system. Now all but the wealthiest travelers have to book seats far in advance, and end up routed through congested hubs. A small-plane fleet, however, could enable travelers to summon a small-plane "air taxi" on short notice and fly directly from the nearest small airport to the desired destination without breaking the bank. Are small planes the way of the future for air travel? James Fallows joins the discussion on his June cover story. Much of the book's narrative centers on the struggles of two aerospace startups. The reader follows the triumphs and setbacks of the Klapmeier brothers, a pair of pilots from the Midwest, as they set out to found a company called Cirrus and develop an attractive, easy-to-fly airplane (equipped with a whole-plane parachute), while holding down costs, obtaining the necessary government certification, and soliciting funding. Fallows also chronicles the efforts of a company called Eclipse Aviation to develop a slightly larger, jet-powered plane, reliable and inexpensive enough to serve as part of an air-taxi fleet. Suffusing the book is Fallows's own love of flying. He strives to convey something of the exhilaration he feels aloft—his delight in the panoramic view, his appreciation for the intense concentration demanded by the task at hand, and his pleasure in the company of fellow pilots. Last September he flew from Oakland, California, to Boston with his wife and son. In Free Flight he briefly describes their cross-country adventure, recounting the marvel of watching the mountains flatten out beneath them as they traveled east, their nerve-wracking navigation of a thunderstorm, and their surprise at the vastness of America's unpopulated expanses. James Fallows is The Atlantic Monthly's national correspondent, and has been a frequent contributor to The New York Review of Books, Slate, and The Industry Standard. His previous books include Breaking the News, Looking at the Sun, and National Defense. He has been a presidential speechwriter, the editor of U.S. News, and a consultant for Microsoft. 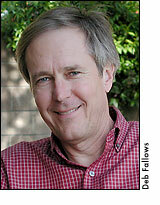 Fallows recently spoke with me on the telephone from Berkeley, California, where he lives with his wife. When you took your first flying lesson did you have any inkling of how important flying would become to your life? I had no idea I would end up finding it interesting. The couple of times I'd gone on small-plane flights with people in the previous ten or fifteen years I was mildly interested, but put off by all the impedimenta and crud of the whole excercise—the planes were in bad shape, the airports were hard to get to, and so on. And then when I took my first lesson it was freezing cold, it was bumpy, I had to get ice off the wings of the plane, I was feeling mildly queasy because of the gasoline fumes, and for the first little while—probably the first five or eight lessons—I thought, Well, I've started this, I might as well see where it will lead. It was only after that that it began to become interesting. I thought, Hey, this is a whole different view on life. You wrote an article for The Atlantic years ago about your flight in an Air Force F-15. It sounded pretty horrible. Yeah. Flying in that F-15, with no preparation and 6- and 7-G turns, gave me chronic, low-level nausea for about the next six or eight years, really. If I got into a normal airline or even a taxi I started feeling bad because of what that had done to my inner ear. By the time real fighter pilots did that, they would have been training for months and months and months. So that gave me a reason not to pursue an aviation career for a while. So it seems surprising that you actually did decide to take up flying after that. It shows the power of amnesia. It sounds as though flying is almost a meditative experience for you—requiring a levelheaded concentration that distracts you from everyday stresses. Do most enthusiasts you've met enjoy flying for similar reasons? I think there are certain things that seem to be typical about this pursuit. For example, it's roughly fair to say that everybody who's interested in it is a man. Now, that's not really fair, because there are some very dedicated, very skillful women pilots. But it's the most male domain I've ever been in. I don't know why that is. I think it's something more than just the dreaded social conditioning, because it's always been that way. There probably are certain people who really like hot-rodding and doing aerobatics and barrel rolling and all that, which I don't particularly enjoy. But most people, from what I've been able to sense, enjoy the combination of two things that go into this. One is a surprising satisfaction that comes from mastering some of the mechanical processes—of knowing how the engine works and at what different stages of flight the engine's supposed to be doing different things. The other is a very nonmechanical, ethereal sense of just looking down on things—in a panoramic sense. I think many people are attracted by those things. It does distract you from the mundane woes of how you're going to deal with the next business chore when you land. I think I'm not the only one who had the childhood dream of flying over my neighborhood. You know, you spread your wings like an angel and you fly over the neighborhood. Did you ever have that dream? It's surprisingly like that childhood dream—or like scuba diving. It's as if you could swim without having to worry about breathing or buoyancy—just being able to move in three dimensions and look at things and swirl around. I had always imagined that most pilots were thrill-seeking types. There's actually someone in our office who recently started taking flying lessons, and what she says she gets out of it is a kind of adrenaline rush. Well, it's possible that she will end up wanting to be an aerobatic pilot and do things like that. I did training in that, but just for safety purposes. I wanted the training in doing loops and rolls and spins, so if it ever happened unintentionally I'd know how to deal with it. But it's something I don't go out of my way to do. Do you think it's that there's a difference between people who've been enthusiasts since they were very young as opposed to people who take it up later? That may well be. Because while I find this really interesting now, I was never in the camp of people who just wanted to be a pilot more than anything else. It could be that people who got started very young and had a much stronger drive toward it than I had are more interested in hot-rodding kinds of pursuits. The mild approximation of that impulse I can understand, though: when you're coming in for landing at an airport, in most circumstances you do this sort of rectangular pattern. Just before you land you fly in the opposite direction of where you're planning to land. Then you do a sweeping turn either to the left or the right so that you'll line up with the runway as you come in. And that is a very satisfying aesthetic feeling as you make that swoop around the so-called "down-wind leg" (when you're going opposite the runway) to the so-called "base leg" (when you turn ninety degrees) and then the final leg when you're going toward the runway. It's like when you're going around a corner at high speed on a bicycle—that sense of enjoyable balance. But most of the time I'm happy to go from place to place without doing rolls or spins along the way. Your desciption of the Cirrus test pilot Scott Anderson likens him to "pilots from an earlier, more romantic age, who combined artistic with mechanical interests." What era are you referring to? I suppose I'm probably thinking of a particular person—Saint-Exupéry. And also, to a degree, Lindbergh. But maybe the era of, say, the twenties through the end of World War II, when there was the sense—I think the proper sense—that aviation was a combination of mechanical-technical and artistic-spiritual pursuits. If you don't pay attention to mechanical and technical things you're in terrible trouble. But there is also something artistic and spiritual about it—of being able to see the world in a way human beings had not done through all of their history, until a century or so ago. And I think that there was a sense that probably still exists only in France of piloting not being just like a version of bus-driving. All writers have a point of view. For William Langewiesche—pilot, Atlantic correspondent, and author of Inside the Sky—it happens to be an aerial one. I think the reason that sensibility has been drained out in the U.S. is that in the last, say, twenty-five or thirty years airlines have become buses. And everything about them is bus-like. You could view the flying of them as just being another purely mechanical chore. Certainly the experience of being on an airliner is designed in as many ways as possible to drain romance, excitement, and spiritual qualities from the process of being aloft—they want you to close the windows; you can't see very well anyway ... it's unpleasant in every detail. Do you think there might be a resurgence of the romance of flight if more people were to start flying small planes? To the extent that people become interested in small-plane flying again, it would be very hard for them not to find it a more than mechanical process. Being able to see your own town from two thousand feet, being able to fly along the California coast or the Atlantic coast—it just is different from being on the USAir shuttle. The central argument of your book is that our contemporary air-travel system is unsatisfactory, but that it could soon be transformed by a new reliance on small planes. At this point do you consider such a small-plane revolution to be inevitable or only a possibility? I think it's something that's possible. It's not inevitable for a zillion reasons—one of which is that the survival of the kind of companies I'm writing about is sort of a day-to-day risky venture. Countless companies have gone broke trying to realize their dreams of new air travel. But the circumstances are better now than they've ever been before—both because the problem to be solved is more acute than it's been, and because the technology is finally right: technology for making safer planes, for guiding them, for making it easier to fly. Did you undertake this book partly as an effort to help make it happen? Yes. I wanted to write about it to improve the odds of this actually happening. By chance I'd come across these interesting developments that I thought were potentially important to the traveling public. The NASA projects that I describe in the book have never been mentioned in a major newspaper. I thought, This is interesting news that's worth telling people about. Why do you think the story was unknown to the general public? Was NASA deliberately not publicizing its non-space-oriented projects for some reason? No, I think NASA would love for these things to be widely known. And within the aviation press there have been a million stories about Cirrus and about the NASA programs. The question is why this has not crossed the membrane to general awareness. I think the main reason is tremendous skepticism by the general public about the world of small airplanes. They have the idea that it's the province of rich daredevils. So there's a sort of inevitable discounting of small planes—as if you read that the America's Cup yachts were going to be used for some kind of commuting purpose. I think that an instinct of skepticism has led people to overlook some very interesting developments. Is it possible that the airline industry might address some of the inefficiencies of air travel on its own (maybe by instituting some kind of self-regulation)? I think the airline industry is in a real bind about this, because it's simply responding to the pressures of the market. In the last twenty-five years, when the airlines have been free to compete on price, customers have shown they'll do almost anything to get the cheapest ticket. And to provide the cheapest ticket, the airlines have to keep the planes full. And to keep the planes full, they have to do hub-and-spokes routing. If you mainly try to have a lot of daily nonstops between, say, Seattle and Atlanta, they're going to go empty much of the time. But if you can route them through Denver or Dallas, you can keep them full. So the airlines are doing what they have to do to survive. Until now there's been a missing element in the hardware lineup, which is planes small enough and cheap enough that you could do a lot of point-to-point air-taxi stuff and keep them full. So I think it's not really the airlines' fault. They're responding to the environment that we, the consuming public, force on them. Aside from changes in travel patterns, are there any broad social or cultural changes that a more fully developed small-plane transport system would bring? Is there a danger that it might lead to a kind of exaggerated suburban sprawl? Many of the changes are impossible to imagine until they actually occur. I think most of the changes that you can imagine from a working small-plane system would be positive rather than negative. The most obvious is the saving of wasted time and the removal of the rigidity built into peoples' lives by the current airline system. I've had a small plane of my own for the past six or seven months, and I can't tell you the difference it makes not to have to worry about booking your travel three weeks in advance, and not having to worry about getting up at six A.M. or four A.M. to make the flight because of the congestion at the big airport. Instead, you can go when you want and change your plans at the last minute without paying through the nose. Even within the limits of today's small-plane system it really does make life easier. The environmental harm it would conceivably do would mainly be through gasoline consumption, because small planes are a less efficient way to get people from place to place than big planes are. But you have to factor in all the congestion costs of major airports. And, in fact, I would argue that there's a likely environmental benefit—that, to the extent that this becomes a feasible means of transportation, it's anti-sprawl rather than pro-sprawl. Almost by definition, car commuting is what builds sprawl, whereas airplane commuting makes it more feasible to have isolated, viable points not connected by strip malls. You can go from one little place to another little place and fly over nice, pristine territory in between. I think it could actually promote the way people prefer to live, which is in beautiful settings, without having to have strip malls linking them to other places. Is it possible that, despite all the new safety devices, small-plane flying could end up becoming more rather than less dangerous, because there will be so many more planes in the air (some piloted by sleepy or preoccupied commuters)? I think it's possible, but it's not something that a lot of people in this field spend time worrying about. And here's the reason. The two overwhelming sources of danger in small planes now are weather (thunderstorms, ice, and that sort of thing), and pilots who are not sufficiently trained getting into John Kennedy-type situations. The sorts of innovations people are designing into the system could really make a huge difference in coping with both of those things. If you had better engines, you could fly above and around the weather; if there were better weather-guidance systems you'd know where planes were in relation to weather systems; if you had planes that were a lot easier to fly you wouldn't have the John Kennedy scenario. And so, if you could reduce those two existing problems, that effect would swamp by a hundredfold the possible negative effect of having a larger and more varied and less controlled pilot population. Fearful flyers seem to be a major obstacle to the rise of a small-plane system. Are people who are truly terrified of flying in a minority? I think people who are truly terrified of small planes are pretty much in the majority. And I think that a rational person who is not by nature an aviation enthusiast would have very good reasons for avoiding small planes at this point. Also, aside from Cirrus and Eclipse, getting a small plane is extremely expensive—it's like buying another whole expensive house. And aesthetically, aside from Cirrus and Eclipse, they're not very nice—they're cramped; they have bad interiors; you can't see out of them very well, and so on. And the only way they enter the general news is through these stories of crashes. The whole epidemiology of small-plane crashes is not well understood by the general public. So, I think the average citizen looking at the circumstances would say, Who needs it? Why would I want to get into one of these things? The only really safe-seeming alternative is the ten-million-dollar corporate jet with professional pilots where, if you're really rich, you can go where you want. I think the potential of the small-plane technology revolution is to make small planes seem more reasonable to people below the millionaire class. If, over time, you have planes that cost only two or three times as much as a car, and you can amortize them over three times as long as a car (which makes the cost comparable to a very nice car), and they're safer and they're nicer, and they're useful, then I can imagine people taking a different look at them. I'm actually one of those people who's irrationally terrified of flying. You're nervous just about small planes? No, pretty much any plane. Well, this makes an interesting question, then. Supposing you were sitting in the front seat of a little plane, and somebody you knew was flying it, would that be more terrifying or less terrifying? I don't know. It's possible that my perception might be that it was less dangerous to be closer to the ground with an awareness of what the pilot was doing, instead of being just one sardine of many in the back of a jet. But I'm not likely to be especially happy in any plane. Well, there are different stages of things that have made a difference for my wife. You can't overstress the importance of the parachute in the Cirrus—you know, the idea that you have an answer to the question of what happens if the wing falls off. (The wing's not going to fall off, but if you're thinking about that, you can pull the parachute.) If you only know about little planes by reading about them, you really do think they're just randomly plummeting to the ground. But if you go to a small airport, you see literally every minute there's a little plane taking off and landing. It's quite a routine thing. Also (this sounds unbelievable, but it's true) if the engine stopped, the plane doesn't become a rock—it becomes a glider. 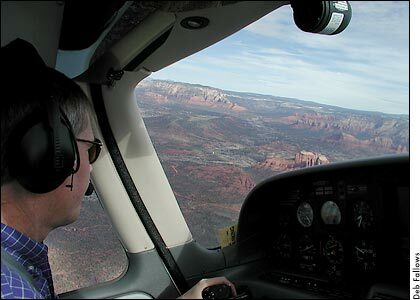 In getting a license you practice dozens of times essentially turning the engine off and gliding the plane in. So something that seems like the most terrifying outcome is actually something that, assuming you can see the ground, you can deal with very easily. You wrote about how the enthusiasts strongly objected to Cirrus incorporating a parachute into their planes. But personally, if I had to get into a small plane, I'd be much more likely to choose the one with the parachute. Yes. The parachute is something I think Cirrus has been very shrewd about. Because, for each enthusiast who sneers at them for having it, there are probably twenty normal people who think, Thank God. Is there something distinctly American about small-plane travel? Certainly, in the practicalities of it, America is aviators' paradise in that there are many, many more airports here than there are in Europe, for example. The Europeans have all these annoying small villages where they could have nice airports. It's much easier to fly here—it's a big spread-out country. And the regulations are more skewed in the pilot's favor here than they are other places. But I do not believe that the impulse to fly is particularly American at all. Indeed, some of the most passionate aviators are Europeans. On the aviation message boards the Europeans are always lecturing Americans in a tone very much like the play Our Town—saying, "Oh, you don't realize how good you've got it. If you were over here you'd appreciate the paradise you're living in." I think it's a human impulse—but a human impulse that just happens to be easier to indulge in the U.S. than anyplace else. A lot of your book focused on the Klapmeier brothers, and it seemed like there were many parallels between them and the Wright brothers (in that both sets of brothers are midwesterners, flying-enthusiasts, inventor-entrepreneurs, and set out to revolutionize the transportation industry). They will kiss your feet for making that point. And I think it is true. What's distinctly American is the entrepreneurial climate. I am impressed how in the high-tech world certain businesses just collect in certain places—the West Coast has the high-tech venture-capital base and much of the software business. And the airplane business is becoming more and more concentrated in the U.S. So it's easier for these people to indulge their entrepreneurial dreams here. Does it seem to you that the advances in small-plane technology are shaping up the way they are because of the initiative of these specific individuals? Or is it more that there's a vacuum in air-transport needs right now and it's inevitably going to end up filled by somebody—whether it's the Klapmeiers, the Eclipse team, or somebody else? I think it's both those things. As long as airplanes have existed, there have been scores of little startup companies with an idea for a brand-new plane. It's almost heart-breaking to read the chronicles of aviation entrepreneurs, because ninety-nine-point-nine percent of them just fail miserably. It becomes clear that people have gone into the business not because they were businessmen, but because they wanted to be around airplanes. Most of the businesses go down in some sort of humiliating failure. What's different now is the combination of that impulse with a market opportunity, some maturing technology, and a supportive role from the government. I think those three things together give these people more of a chance than their predecessors thirty years ago might have had. You explain that the government has been instrumental in fostering small-plane innovation by offering research-and-development grants to small companies, but you describe the quest to come up with adequate funding as one of the greatest challenges for both Cirrus and Eclipse. Do you think the government should be doing more? I think the government's role has been quite shrewd. They've put in (by the government's standards) hardly any money at all. I believe that all the government's spending, calculated over the past decade or so, is under one dollar per American. It's somewhere in the less than two hundred million range. (If it's more than that, it's only by a little bit.) So, the government has been very careful, and it's used the money in a performance-oriented way—saying, "Here is the result we'd like to see; we'd like to see a plane that meets these safety standards; we'd like to see an engine that can do this and that; we'd like to see a guidance system that makes it this much easier for people to learn how to fly." And then it sponsored competitions among companies, saying, "If a company can meet those standards, and if the company will bear much of the cost itself, then we'll help that research along." I think that's much better than the standard defense-contractor, big-payroll approach. And the proof seems to be in the results they've gotten. So I would be happy if NASA continued more or less the way it's going now—with these modest, carefully targeted competitive grants to urge people along an innovative path. Tracy Kidder's The Soul of a New Machine—published in the late 1970s at the cusp of the information-technology revolution—documented a group of engineers' quest to build a smaller, faster computer. Do you see Free Flight as a similar type of project? The Hardy Boys and the Microkids build a computer. Debugging the computer "Eagle." Well, just as the Klapmeiers would embrace you for comparing them to the Wright brothers, I would embrace you for the comparison to that book. It was the first really successful book to tell the story of technological innovation. And it was, in a modest way, what I was trying to do here, too. My goals with this book were to talk about the state of air travel, to talk about the process of flying, and why it's interesting to people, and, finally, to tell about the challenge and puzzle and story of building a business, and how these innovators try to make their businesses live, while solving their technology problems. So in that way I was trying to learn from what Tracy had done. What effects are the slowing economy and the shaky market likely to have on the success of Cirrus and Eclipse, and the development of the small-plane industry in general? I think that their plans are much more long-term than a year or two's stock market difficulties. Indeed, if their plans had been based on the assumption of continued bubble wealth, they would be in trouble. Certainly, it did help both these companies that there was such bubble wealth over the last two years. But their project times are necessarily laid out in five, ten, and twenty-year horizons. So they have to assume that in the long-term this will be a valuable product to a significant number of people—not just those with windfall profits. As far as I know, the orders for both Cirrus and Eclipse remain very, very strong. Cirrus's only problem right now is turning out the planes fast enough. And they're doing it now at the rate of a little more than one a day. How do you anticipate that the mainstream, large-scale airline industry would adjust itself to the rise of a small-plane transportation system? Interestingly, I saw a story that United Airlines just last week had bought shares in a so-called fractional jet program. If you're a sort of rich, but not really rich person, you can essentially buy a one-fourth or a one-eighth share in a business jet—a jet costing about eight- or nine-million dollars. And you're able to use it a certain number of days per year. This is a way that I can imagine the airline companies embracing this business, rather than trying to stamp it out. Because if new hardware exists—if new airplines like the Eclipse and like a faster Cirrus come on the market and make it possible for air-taxi services to exist, somebody has to run those air-taxi services. And it's plausible that that somebody could be United. You could call United and say, I'd like to be on your flight 209 from New York to London tomorrow. Or you could call and say, I just need to go from New Haven to Madison, Wisconsin—pick me up at the New Haven airport and take me straight to Madison in a little plane tomorrow. I could imagine the airlines embracing this, if they were agile enough. Are the airlines in the best position to take on this kind of service? It depends how nimble their corporate culture is—whether they can get out of the mindset of just moving huge numbers of bodies per plane. Some people have suggested that the ideal industry to take this over, actually, is the rental-car business. Because the rental-car business already does the same kind of thing an air-taxi business might. It has its hardware placed all over the country, available on demand. If the rental-car business could adopt the safety standards of the airline business, that would be the ideal combo. Having flown cross-country with you in a small plane, what do your wife and son make of the idea that small-plane travel might become routine and ubiquitous? As I try to say in the book, it's not really a practical way to go from San Francisco to Boston any more than a car is—it's more of an adventure. But I think they're happy to have had that adventure. It was by far the most difficult flying we've done, because we had to go over so many different kinds of terrain and through different kinds of weather—we got into a thunderstorm, etc. But given the right circumstances I think everyone in my family now views our small plane as an actual practical advantage. It's very practical for commuting within one time zone. We'll live in D.C. again this fall, and when I go visit my son in Boston, flying myself will be the easiest way to get there. Sage Stossel is a senior editor of The Atlantic Online. She draws the weekly cartoon feature, "Sage, Ink." Her most recent interview was with Diane Ravitch.